I really liked the friendliness of the staff from checkin to check out. I was a lone and felt really safe. The friendly staff all over the place from checkin to check out . I was a lone snd really felt safe. Some of the towels smelled and next door customers had dogs in their room. During night and early morning, they were barking nonstop. Quick stay on our way to our final destination. Decent room, clean but smelled funny. Hotel was great. The only thing that was terrible is that they had conferences going on at the hotel and everyone smoked right outside the front door. So when walking in or out of the lobby you were greeted by clouds of cigarette smoke. Took 15 minutes at check in - front desk person was missing. Supposedly was in the bathroom. hotel staff was great and helpful. our stay there was great. the room was comfortable the breakfast was good to. I usually enjoy IGH properties, having stayed at many different ones in the past. This Holiday Inn Express is right across the street from the Marriott Courtyard, so a very good neighborhood and location, & the HI was about $25 less per night. I wish I'd spent the extra money for the Marriott. The front desk clerk never even said hello, no greeting, just "Last name?" when I checked in. Every night at least one other guest chose to have a loud conversation in the hallway outside my room. I poked my head out my door each time, and asked them to stop; they did, but I didn't understand why they were in the hallway and not their room in the first place. The food in the bar was good, and the servers were friendly enough. But the other guests who stayed there were rude and intrusive. I understand travelers wanting to say hello and start a conversaion, but when I went in there with a book to read, and sat by myself, I thought that would discourage people. One old man tried to buy me a drink and when I refused, the bar tender "sided" with him, saying "it's too late, he's already paid for it." We had to get the manager involved for me to be able to refuse a drink from a stranger. I told them both, I don't let strangers buy me drinks. They were like, "Why not?" I said "Why should that matter? I don't like it and I don't want it." I shouldn't have had to argue about this with the other guest, the bar tender, or the manager. If you want peace and quiet (& respect), stay elsewhere. For the price breakfast should have been included. Though location was fine. Perfect, on this trip. Staff helped unload and load the car room was clean and comfortable computers (3) always available in the lobby dining room open for breakfast UNTIL 11 a.m..........can't beat that, though they could lower their prices somewhat for piece-meal orders. nice, you guys did a great job. clean room, fast room service, I will be back. Everyone at the hotel was super friendly and helpful. The hotel was very clean and well kept, room clean and comfortable. We appreciated the refrigerator. The only thing we found inconvenient was the ice machine - there was only one and it was on the extreme other side of the entire hotel on the 3rd floor. We experienced both the continental and full buffet breakfasts - both were satisfying, fresh and delicious. I'll repeat myself by saying the staff in the hotel and in the restaurant each morning were extremely helpful, attentive, friendly and efficient. If we find ourselves in this area again, we'll definitely stay here. I am a female and was traveling alone for work. The staff was very friendly and welcoming. The hotel felt safe, it was clean the restaurant downstairs was convenient. The only issue was that I tried to Uber and there wasn't always one available. Also, a friend had a bit of trouble finding it and the cab company I used was 15 mins late in the morning due to traffic so I'm not sure that the location is the most ideal. Reaching the hotel was efficent and the room was neat. The room was more than I expected. Very nice. Great value. Holiday Inn Lansdale - Hatfield places you 4.9 mi (7.9 km) from XL Sports World. This 182-room, 3-star hotel has 2 restaurants along with conveniences like an outdoor pool and a 24-hour fitness center. Enjoy dining at 1750 Bistro, one of 2 onsite restaurants. Savor a meal from the comfort of your room with room service, or make new friends over drinks at the bar/lounge. For your convenience, a buffet breakfast is served for a fee on weekdays from 6:30 AM to 11 AM and on weekends from 7:30 AM to noon. A 32-inch flat-screen TV comes with cable channels, and guests can stay connected with free WiFi and wired Internet. The bathroom offers hair dryers and free toiletries. Other standard amenities include a refrigerator, a microwave, and a coffee maker. 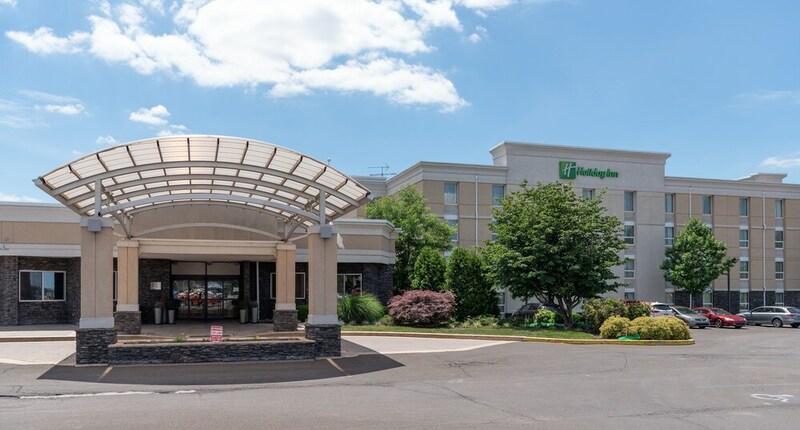 Holiday Inn Lansdale - Hatfield features a nightclub, an outdoor pool, and a 24-hour fitness center. Free parking is available if you drive. The front desk has multilingual staff standing by 24 hours a day to assist with luggage storage and dry cleaning/laundry. Additional amenities include free WiFi in public areas, conference space, and a 24-hour business center. Thank you for choosing Holiday Inn Lansdale for your recent accommodation needs! I am so happy that our staff was able to leave a lasting impression on you! Guest satisfaction is of utmost importance to us and it is nice to see that our team is achieving this goal. Thank you again for taking the time to provide us with your feedback and we hope to see you again soon! Thank you for choosing Holiday Inn Lansdale. I am so happy to hear that you had a great stay with us! It is nice to see that our staff was able to create a very welcoming stay. Thank you again for taking the time to provide us with your feedback and we hope to see you again in the future! Thank you for choosing Holiday Inn Lansdale for your recent accommodation needs. I am glad to hear that you had a pleasant stay with us. I do wish to apologize for any inconvenience you may have experienced during your stay. Please know that guest satisfaction is of utmost importance and we will be using your feedback to help ensure this for all guests in the future. Thank you again for taking the time to provide us with your feedback and we hope to see you again in the future. Thank you for your recent stay at the Holiday Inn Lansdale Hatfield. I want to begin by apologizing for any issues you may have faced during your stay. We strive to make each guest stay as pleasant and comfortable as possible and understand your stay was below average. We take feedback very seriously and will be using yours to help create a better stay for all. We hope you will give us another chance to show you that your stay was the exception. Thank you for choosing Holiday Inn Lansdale for your recent accommodation needs. We appreciate you taking the time to let us know you had a pleasant stay. We do sincerely apologize for the state of the room and we will be looking into this in future reservations. We consistently use feedback in order to create a more comfortable stay for all guests. Thank you again for taking the time to let us know how your recent experience was. Thank you for providing your feedback. We are happy to hear you had a pleasant stay. We sincerely apologize though for the issue you experienced with the entrance of the hotel. We will be taking measures to avoid the same problem in the future. Thank you again for providing your feedback and we hope to see you again! Dear Valuable Guest, Thank you for choosing Holiday Inn Lansdale, we appreciate your feedback about your experience. We strive to make each stay as pleasant and comfortable as possible, and we appreciate that our staff was accommodating to your needs. Hope you choose us again for your next visit. Have a Wonderful Day. Buffet breakfast is served on weekdays from 6:30 AM to 11 AM and on weekends from 7:30 AM to noon for a fee. 1750 Bistro - Restaurant open daily for breakfast and dinner. Zinc Bar and Lounge - Lobby lounge. Open daily. Recreation features at Holiday Inn Lansdale - Hatfield include an outdoor pool and a 24-hour fitness center. The preferred airport is Philadelphia, PA (PHL-Philadelphia Intl.). The following credit cards are accepted: American Express, Carte Blanche, Diners Club, Discover, Mastercard, and Visa.